Day 4 of Sneak peeks - Clearly Coordinating Card kits! Clearly Coordinating Card Kits for August! Go to card kit store section here! Miss Trudy designed our card kit stamp for August and I just think it is one of the cutest little ducks I've ever seen! What do you think? This is my favorite card kit yet! I can't believe I found such perfect paper for Trudy's little ducky! I decided with this card kit to cater to both Copic lovers and Tombow lovers! I made kits that have watercolor paper for Tombow users, and Copic paper for Copic users! This is the Watercolor Paper and Tombow marker Fuzzy Ducky Card. Everything is precut and ready to assemble! This card kit comes with WATERCOLOR PAPER to use your Tombow markers. Tombow markers NOT included. This is the Copic paper and Copic marker Fuzzy Ducky Card. This card kit comes with COPIC PAPER to use your COPIC markers! COPIC markers NOT included. This card kit is just as adorable as the last....don't you think? This kit includes all the pieces to assemble these adorable little cards! This set is perfect if you have your own stamp set, or want a few more cards than included with card kit 5! Fuzzy Ducky Bulk Card Kit 7 - 18 cards and you receive the FUZZY DUCKY STAMP SET FREE! This set is perfect if you are making cards for gifts or as a ladies get together! FREE FUZZY DUCKY STAMP SET! Look what Katie made with this paper kit...so pretty! These kits make it so easy to whip out cards in a flash....make sure to stock up on them for emergencies and creative get togethers with your crafty friends! Day 3 of August sneak peeks! Thanks for coming back for day three of sneak peeks! I just love these cages and birds that Trudy drew! So cute! This set has so many uses: encouragement, love you, anniversary/wedding, thinking of you, and just an any reason card! You are certain to make beautiful cards with this set for your baby showers! Kim picked the perfect sayings to go with her illustrations! This little piece of cake will work for birthdays, anniversaries, and wedding cards....pair it with one of our single sentiments and you have a beautiful card in minutes! My girls just love Little House on the Prairie reruns....and doesn't this set remind you of this? You can use this set for all your fall cards and scrapbook pages! Coordinating digital images are available here ! Day 2 of August sneak peeks! Day two of sneak peeks! I thought it would be really nice to have a scripture set for all card occasions combined in one! This one covers get well, birthday, praying for you, sympathy, friendship, encouragement....and so much more! This set is a must have! Don't forget...our value verses are 20% off every day! This was our Customer Collection set for the month! Make sure to take a look at all our samples and descriptions here! As popular as peace signs are, we just had to have a little mini set....just in time to start making locker decorations and decorating school supplies! There were so many times I just needed a simple little flower to watercolor to match my project....so here it is! Ready to color and grace your cards and scrap pages! Let the August sneak peeks begin! Thanks for coming to day one of our sneak peeks! We sure have some really cute stamp sets this month! Fall is just around the corner, gasp! Yes, fall is just around the corner and so we are thinking about what we can help you with for your fall stamping....you are just going to love these sets! Fall is just my favorite season! These little autumn critters are just adorable. Laurie does such a cute job creating our little friends! I cannot tell you how happy I am about this set! I think it is just so cute! This little set is a home room mom's best friend for the upcoming fall parties....go ahead and get started now....it will be here before you know it! We have so many frog lovers out there....and we're sure you are going to love this stamp of the month! Perfect for birthday cards or just a thinking of you card! Who doesn't like a polka dot background? I think they are sweet for baby cards and bright for birthday cards! With our upcoming release of ink pads to match our cardstocks, you will want to have this stamp for certain! Hi friends! Its Katie here to welcome you to another Tuesday Tutorial. I cannot lie and must tell the truth and that is that I've got a love affair with these uber cute 3x3 notecards and my new Scor-Buddy! Yup... I've got a another set of cards and a great way to house them... think of this is a pre-cursor of something to come that you will see at the end of the week. So, here you go: I used Basic Grey Lemonade, Song Bird Silhouettes, Labels 8 Nestabilities, Scor-Buddy, Clearly Coordinating Cardstock, ATG gun and Tape. This is a great project for assembly line creation and/or mass production. I started by cutting all my card bases (3" x 6") and the scor-buddy is perfect for scoring these babies. Then cut your designer paper. I've got a base layer (solid) and a pattern to layer over that. I cut everything in 1/8" smaller increments. This is where using your coordinating patterned and colored paper like the Basic Grey tablets whether they be 12x12 or 6x6 come in so handy... it all works perfectly together. Next, cut a handful of labels for your sentiment. I used the next to smallest die in the Labels 8 nestabilities set. Since I didn't need the entire label, I decided to cut them in half which is so easy to line up on my cutter. Then I laid them all down and stamped my chosen sentiment from the set called Song Bird Silhouettes. I then created a very easy but pretty border to attach to my card fronts. I used an EK Success border punch and more of the Basic Grey paper. Now, its just a matter of putting all your pieces together. And for another fun detail, I stamped the inside of each note card with one of the birdie stamps. Now on to a cute little case for these beauties. You want to start out with a 6x6 piece of cardstock. If you didn't know or didn't realize, there are 12x12 versions of all the Clearly Coordinating Collection Cardstock. Today, I started off with a piece of Red Velvet Cake. Then grab your Scor-Buddy and score 2 opposite sides at 1 1/4". Here is a closer picture of the measurements. As you can see they are divided up into 1/8" increments which is very handy and if you notice there are edges only on the top and left side. This allows for cardstock measurements that go beyond the 7" mark. Now, flip your cardstock and score at 2 1/4" in on both sides. Before putting the box together make sure to add any decorative paper to the front and back. I chose to use some more of the Basic Grey Lemonade and cut 2 pieces to 3 1/4" x 2". Next cut the 2 inside shortest score marks and apply adhesive where shown. Fold up one of the longer side flaps over the small middle flap. Then apply adhesive to the longer front flaps and fold up. The side doesn't go to the edge. You can leave it just like it is or you can add another piece of designer paper. Mine measured 1 1/4" x 2". Here's a picture of the 2 sets of note cards that I created for this little gift set. I made a total of 8 note cards, all very flat so you could fit even more in this little box. And finally, I opted to use the Fresh Papaya ribbon from the Clearly Coordinating Collection to wrap around my box. Just added the sentiment to another label and pop dotted that to the front. Well I hope I have added to your love affair with the 3x3 note cards! Thank you for spending your time with us at Clearly iStamp and hope you have a wonderful day! Don't forget that Sneak Peeks are TOMORROW!!! Yahoo! It is Wish List Friday again! As many of you know, we listen to our customers and try to create sets that YOU want.....so here is the set that I created for a very nice lady that I met at a scrap show in Conway Missouri! I didn't write down her name, so if you see this, you'll have to let us all know it was you! We discussed how nice it would be to have sentiments for all different occasions that would fit in this same card.....so you could make about 6-10 of these cards and be ready for any occasion at a moments notice! So I came up with this set, just for my Conway lady :-) I thought it was a great idea! This set covers: Thank you, Anniversary, Wedding, Get Well, Friendship, Sympathy, Thinking of you, any Special Days like birthday, graduation, etc. You cannot go wrong with this set! The below cards are perfect to make in bulk and then you can stamp whatever saying is appropriate for the occasion at the last minute! All the sayings fit in the same spots! Note: The variegated colors of flowers are made by stamping it with fresh ink and then stamping again on your card without re-inking the stamp. Clearly Coordinating Collection: Sweet Cheeks, Cottonball White, Hot Cocoa, and Worn Parchment cardstock, Sweet Cheeks Velvet Ribbon, Hot Cocoa sheer ribbon. Everyone is always asking for cards for men.....here's one! Note: The variegated colors of flowers are made by stamping it with fresh ink and then stamping again without re-inking the stamp. Clearly Coordinating Collection: Ripe Olive, Wild Ginger, and Cottonball cardstocks, Wild Ginger sheer ribbon, Ripe Olive Velvet Ric Rac, Ripe Olive ink pad (YES! We have ink pads coming! Woo-hoo! This one is available August 1st), All items on this card are included in the Green at Heart Paper Kit! Clearly Coordinating Collection: Ripe Olive, Wild Huckleberry, and Cottonball white cardstocks, Ripe Olive sheer ribbon, Wild Huckleberry ink pad (YES! We have ink pads coming! Woo-hoo! This one is available September 1st), All items on this card are included in the Green at Heart Paper Kit! Here are a couple of samples by Gloria...aren't they gorgeous??? Don't forget.....these posts are the place to put your requests! You can also email them to me at Lori@cleardollarstamps.com! You never know when one of your requests will show up here! 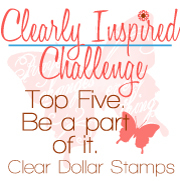 Don't forget that a Clearly Inspired Challenge is open right now. You've got until August 5th to play along and as usual there is always a big prize up for grabs! Click ---> Here <--- for all the details. Hi friends, its Katie here to welcome you to another Tuesday Tutorial. Today's little project was inspired by essentially the same project that Splitcoast Stampers was featuring last week or the week before. It was just way too cute - I just tweaked mine a bit to fit 3x3 cards. I also decided to focus on my new favorite cardstock that you can find at Clear Dollar Stamps. It is absolutely divine and because it is so glorious I wanted to make it the main focus of my project. The cardstock is called Wild Huckleberry and is part of the Clearly Coordinating Collection (coordinating tombow markers, copic markers, cardstock, and ribbon). Most of the cardstock in all 4 season collections are labeled as layering weight which means that they tend to be a bit lighter and you can layer and layer without adding lots of bulk to your card fronts. In the case of Wild Huckleberry, its quite substantial and has an incredible shine and has an iridescent sheen too it. I hope you are able to see what I'm talking about in my photos. Here are your main ingredients... you don't need much and of course I left out the 2 punches that I use later on. AND did you notice my new Scor-Buddy??? We'll start off with the insert/drawer. I used Cottonball White which is a great sturdy cardstock. Your piece needs to measure 7 1/2" x 7 1/2" and you will need score all 4 sides at 1" and 2". Fold on all score marks and cut where indicated. Remember it doesn't matter which 2 opposite sides you cut as long as they are opposite of each other. Next, I always trim away my edges for easier folding. I do this for all 4 corners. This is what your box will look like pre-folding. Next, you'll want to fold in your sides. You apply adhesive to the outermost fold on all 4 sides, BUT I ALWAYS fold down the sides that I consider my tabs "attached" to. Next fold your other 2 sides in... they will naturally fold right over those tabs. Next, you will want to cut a strip of Wild Huckleberry measuring approximately 4" x 1/2". Score in 1/2" on both short sides. Then you will want to align one side of your strip to one side of your box that you just made. Just pick your favorite side... they are all the same. Then head on over to the other side and do the same thing... your piece will push itself out to create an automatic handle. Now to create your covering. You will need a piece of Wild Huckleberry that measures 8 1/4" x 5 5/8"
Score in 1" on both the left and right side parallel to your longest side. Flip and score the two shorter sides at 3 5/8" in on both sides. Snip your center score marks and apply adhesive where marked. Fold your flaps down towards the center. Flip over and decide which side is going to be your top... then cut a piece of Cottonball White measuring 3 1/4" x 3 1/4" and a piece of Wild Huckleberry measuring 3 1/8" x 3 1/8". Layer these. Next, I decided to use the stamp set Daisy Flower Tag ( from this Card Kit) to decorate my box lid. This little mini stamp set is PERFECT for this. I stamped the sentiment and then used a scallop punch to punch it out. I used the Wild Huckleberry Copic Marker (V06) to color in my image after I stamped it with memento tuxedo black ink. I'm only using the one copic marker, but if you let your image sit and dry for a bit then you can come back in and add a bit of dimension by using the same marker and just adding an extra layer of ink on your image. I did this just to the insides of my petals. Its subtle, but its there. I then used a 2" scallop punch to create my layering piece. Now attach your designed top to the box top. Next apply your adhesive on flaps shown below. My final step was to cut all the pieces out to create my 3x3 cards. The layout for these cards are the exact same as the top of the box. Cards measure 3" x 6". Just score in 1/2 and fold. Wild Huckleberry pieces measure 2 3/4" 2 3/4" and the white strips measure 1" x 2 3/4"
When done, just place your cards in the drawer and close up. And one final note for you. As you probably noticed, I had both the large and small scor-pals in my photos. I originally thought I would never need the Scor-buddy (the cardmaking version), but I have to be honest and say that I love it. It takes up a much smaller piece of real estate on my craft table and I reach for it constantly. Would I give up my big board... NO WAY! It too is essential, but I am loving my Scor-Buddy for sure!!! Thanks for stopping by and spending your time here at Clearly iStamp. I hope you have a wonderful Tuesday! Hey Friends! Its Katie here to invite you on a BIRTHDAY BLOG HOP CELEBRATION today. Yup, you guessed it... today is our fearless leader's birthday and we'd all like you to join us in wishing her a most wonderful day today. Thanks to one of our wonderful design team members, Cassie (shhh... don't tell her I told you) we have decided to share our birthday wishes for Lori with a blog hop. To start things off, here is a beautiful card that Candy Fosta created for Lori. She and Lori go waaayyy back and I think its a wonderful way to start our BIRTHDAY BLOG HOP. Make sure to keep on hopping and check out all the gorgeous creations that were made in order to help Lori kick off a perfect birthday celebration! Thank you so much for sharing in our enthusiasm and joy in wishing Lori a wonderful day and thank you Candy for starting us off with a beautiful card. Summer is now midway and the weather is getting hotter....which makes us want to run into our air conditioned craft rooms! While you're there, you need to take a look at the cute digis we have for you this month! This digi set is FREE WITH ANY PURCHASE! That's right! You don't even have to pay for this adorable little set that lets you brighten someone's day! What a peaceful little scene.....makes me want to go to the beach! Perfect for an any time card and to just let someone know you are thinking of them! Isn't this little guy cute? I love all the bright colors our design team used to make this little guy so cute! Perfect for birthday cards, to send a friend to cheer them up, let someone know you miss them, or just to let someone know you are thinking about them! How do you like our little church mouse? He is just the friendliest little mouse and eager to let all his church friends and visitors know just how he feels! Perfect to welcome a visitor, let someone know you missed them, invite someone to a church event, or as an any reason card! Cute, cute, cute! Do I need to say any more? The sayings are just adorable to match this little lamb and a sure hit for your digi collection! Prayer is the most important and life changing thing you can do for anyone. Why not lift someone up in prayer and encourage them by letting them know what you are praying for and how you are praying for them! Be a blessing and encouragement with this digi set!